There’s a debate out there somewhere over just how many pages of regulations the government has published to govern the Medicare program. Thousands? Tens of thousands? Hundreds of thousands? The answer depends on how you define the word “regulation.” But for physicians and office staff, the answer is pretty simple. Medicare has TOO MANY rules regulating how doctors must care for their patients and what they need to do to get paid. Don’t follow those regs and you don’t get paid … or you end up on the wrong end of a fraud investigation. Where can physicians and office staff find answers to common Medicare questions? How can physicians change their Medicare participation status? What should physicians do if they want to waive copays and deductibles for Medicare patients who can’t afford to pay them? The new Medicare Advance Beneficiary Notice that physicians must begin using on March 1, 2009. What do physicians need to know about documenting Medicare patient consultations? How can honest physicians best protect themselves from making mistakes that might trigger a fraud investigation? 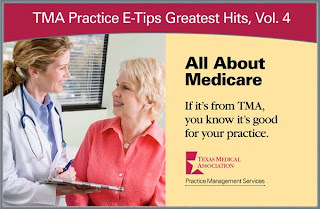 How can TMA’s mini-consults and coding hotline help physicians with Medicare problems or concerns?